Complementing and expanding on the guidance in the PRINCE2 manual, this publication covers a divers range of situations, using case studies based on real experience. You will find out how to assess a project to determine what level of tailoring is required, and how to embed PRINCE2 effectively within your organization to enhance the benefits of using this method. The author, Alan Ferguson, is vastly experienced in project management and a leading figure in the development of PRINCE2. By bringing project management to life, he shows you how to make PRINCE2 work for you and your circumstances. A must-read for those who want to get the most out of putting PRINCE2 into practice and enjoy improved delivery as a result. 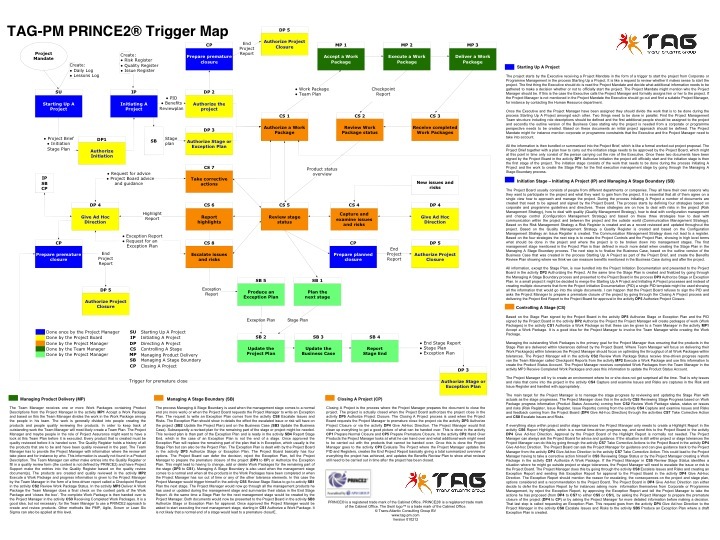 I received from Frank Turley and Nadar K. Rad from Management Plaza their product: “A fully documented sample PRINCE2 project“. I was already earlier in the position to give comments on a draft version and if I now look at the result, I think this can definitely be of help for you to understand and to implement it in your organization. For me this is a fantastic example of the building block philosophy I introduced in my book “PRINCE2 in practice”. 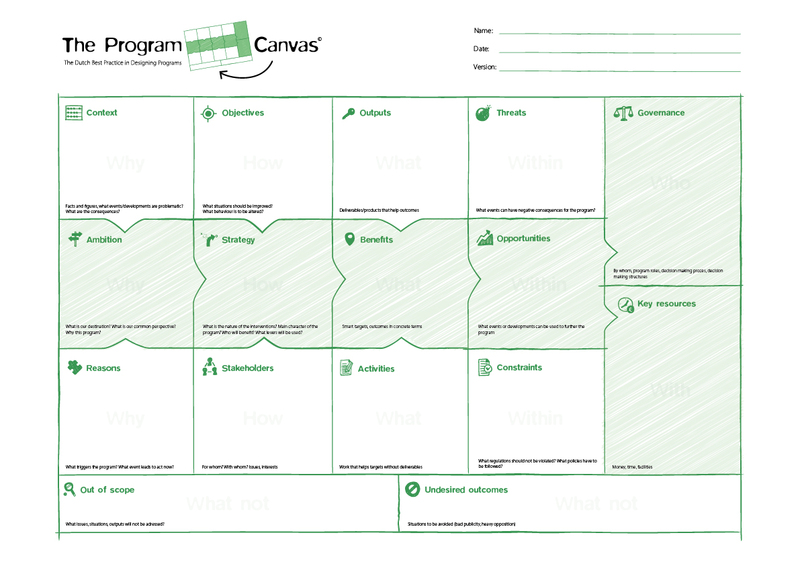 What you will get is a presentation/storybook which takes you by hand to look at a project scenario, and based on this scenario you will follow the project lifecycle and focus on the management products. The scenario is about improving client relationship and reducing loss in client turnover by giving them a high quality promotional pen. The project is about this Pen. Page by page you will follow the steps and the creation of the necessary management products. You will get a navigation diagram showing where you are in the project life cycle (pre project, stage 1-Initiation, stage 2, stage 3 (final)) and the documents you have to create. On top of the diagram you get the processes. I would suggest including, in a next version, in which process you create what document. Starting point is the project mandate. This contains at least the rationale and objective. This is the trigger for the project and can be anything. This will be used to start writing the Project product Description (example is given). At the end of pre-project you have seen examples and if needed additional explanation, of the Project Brief including underlying products like the Project Product Definition, the PMT, outline BC and the Initiation Stage Plan. The following step, after Project Board approval, will be the Initiation stage. You start with the four Management strategy documents and an example for the Communication Management strategy is given. Than you need to get clarity on the full scope. A Product Breakdown Structure needs to be created. For me a little bit confusing how it is presented on the overview page. It looks like you will do this, at that moment for the Next Stage Plan. I would start with a PBS for the Project Plan and than a refinement for each Stage Plan during Managing a Stage Boundary. At the end of this stage you have seen examples of the PID, including the underlying documents like the Management Strategies, Project Plan, Project Control, tailoring, BC, and Product descriptions. I would suggest showing here the updated PMT and Project Product description too. As a separate document the Benefits Review Plan is shown. I would show it a little bit later in the steps within this stage. Also the formal registers are introduced including an example of the Risk Register. The next step will be the Managing a Stage boundary process activities. Here you will get examples of the Product Flow Diagram and the Stage Plan, including the Schedule. During the next Stage, the first delivery stage, you get examples of a Work Package, Issue Register and Issue Report and the Highlight Report. Again you will get the stage boundary activities including examples of the next Stage Plan, the Schedule and Product Flow Diagram. Also configuration management is introduced. I would suggest to position the Configuration Item Records together with the other Logs and Registers. Now it gives the impression that we will have a Configuration management register as well as Configuration Item Records. The End Stage Report is introduced as well as the Lessons Report. I would suggest including, as a separate document, the Lessons Report into the End Stage Report. Than, we will go into the final delivery stage. Here we will get examples of the Quality Register, the Product Status Account, End Project Report and Lessons Report. 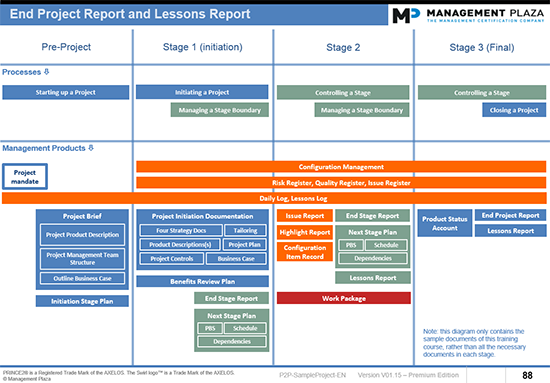 Same remarks here as stated earlier, include the Lessons Report as a separate part of the End Stage Report. These documents will be created in the Closing the Project process (not shown). Finally I would suggest to make a remark of the Follow on action recommendations as part of the End Project Report otherwise you would have some potential open ends. Conclusion: a great example with some minor improvement points, but this is for a next release (feedback from the authors: these comments will be taken into account as part of our next release in January 2014). 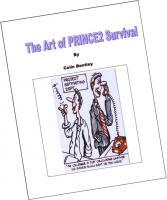 I just read the book The Art of PRINCE2 Survival by Colin Bentley. Colin was the lead mentor of the latest revision to the manual, released in June 2009. The book is very easy to read and Colin included several humoristic drawings to accommodate the text. It’s not a book to describe the whole PRINCE2 methodology but it gives you a pragmatic, common sense view on several topics related to the Organization, Risk and Issues, quality, Planning, and several documents including examples of very down to earth documents like a Product Brief, a Product Description, a Work Package and a Lessons Report. I really like the examples to simplify e.g. the work package into a one pager. Also his quote “Don’t write a progress report for a busy manager that takes longer to read than the time between his/her phone call – and that is one page.” is exactly what I want to achieve with my book PRINCE in practice, a practical approach to create project management documents; how to avoid bulky, inaccessible, standalone, and illegible documents. Also his proposal to integrate the Issue Register, Issue Register and Issue Report into one problem report makes sense. The first chapter of the book is a different one. 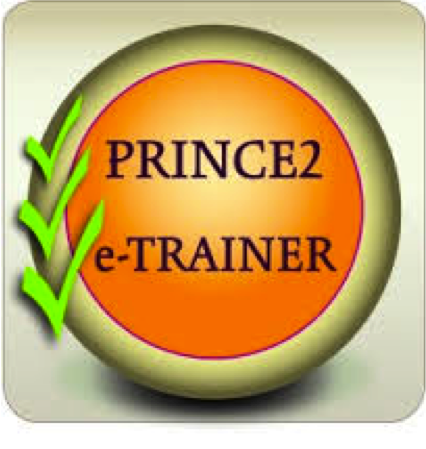 It gives you an overview of the seven principles on which PRINCE2 is based including simple schemes to show which principles are supported by which processes. Something the official manual will not show you. In my opinion a good book for those project managers who just passed their PRINCE2 exams and who are now struggling to put the methodology into practice and who are looking for some pragmatic advice. Huge piles of paper to read or not to read? Last week I visited the BPUG (Run the business – Change the business; Who makes the connection?) in Utrecht, and discussed with lots of colleagues about project management. I also had the opportunity to have a short talk with Lex Dirkse, a professional cartoonist. I explained my philosophy that I don’t want to see project managers sitting behind their PC’s and creating huge piles of paper, sometimes called PID’s. In my opinion they must communicate and only write down the essence of what was discussed, instead of writing a lot of pages and simply give this to senior management. I have seen too often that large documents were not read at all by senior management. 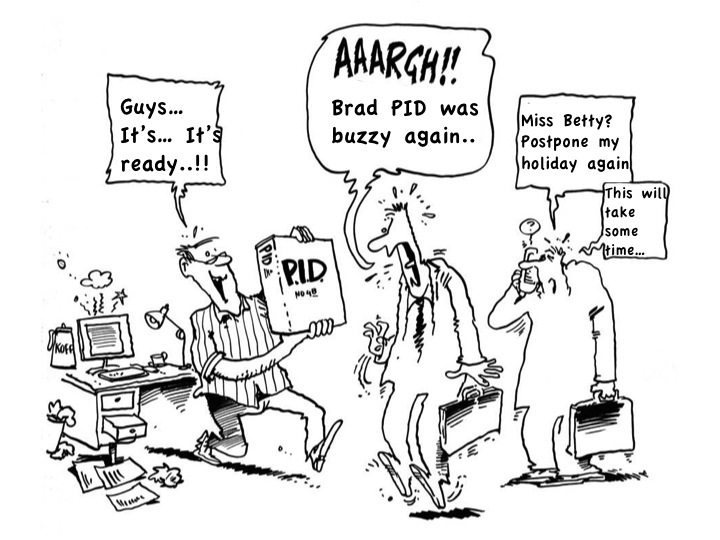 He translated this short story into a cartoon, showing a project manager, called Brad PID, creating a huge document while drinking lots of coffee. As he is finally finished, senior management received the PID. As a consequence the senior managers had to postpone their holiday to read the document. So this PM could still be happy because his executive wants to read it, even if it costs him a lot of time. But in real life I don’t believe this will happen.